Golf on the Costa Blanca is well catered for. 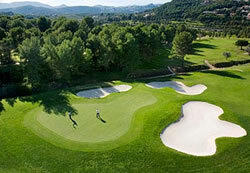 Javea has an excellent 9 hole course, and Denia also has a an 18 holer designed by Jose Maria Olazabal. 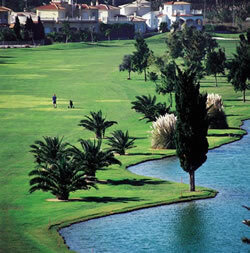 Oliva which is quite near boasts a course designed by the immortal Severiano Ballesteros. There is a further nine holer in Moraira. 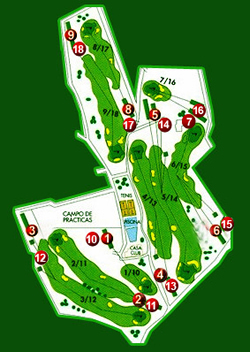 The course was designed by Francisco Moreno and opened in 1981. The course is a gently sloping 9 holer with well-maintained greens and fairways flanked by palm trees, pine trees and orange trees. Although it has only 9 holes, on the second time around or back nine, many of the holes are played from different tees making it virtually an 18 hole course. Also the 4th / 13th green is large enough to accommodate two separate pin positions for each hole. 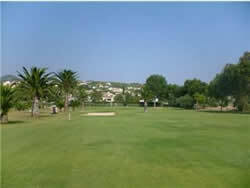 Green fees are about 40 euros for 9 holes and 75 euros for 18 holes. There is secure car parking. There is a clubhouse, bar and restaurant - see a sample menu here. Golf lessons can also be arranged and as usual, you will find one of the club's Pros in the club shop. 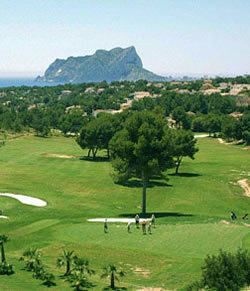 Visit Javea Golf Club website by clicking on the hole map. 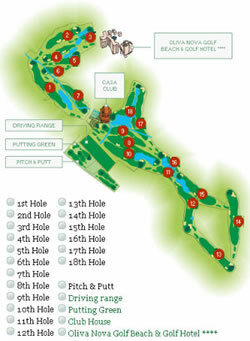 La Sella is an 18 hole par 72, 6289 metres course opened in 1991 and designed by Juan de la Cuadra. The course features a putting green, driving range, restaurants, buggy hire, clubhouse, changing rooms, showers, sauna, club hire, pro shop, and tuition. Once a most outstanding courses, recent reviews question the condition of the course, especially the back 9 - see reviews here . Also questioned is the cost, 75 euros. Click on pictures on the left to visit their website. 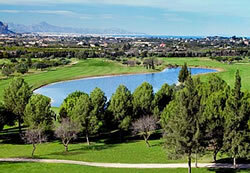 Designed and built by Seve Ballesteros, the Oliva Nova Golf Club course extends to around 50 hectares. It is a par 72 links course of 6,350 m with a slope of 120, the main characteristic of which is that 15 of its 18 holes include water obstacles. The only holes that have no water obstacles are numbers 2, 13 and 14. Although almost absolutely flat it has many trees and water obstacles (canals and lakes - which provide the irrigation). It is a private club with restricted membership but the holidaying public are allowed to play and use the well appointed clubhouse. Facilities include driving range, putting green, motorised trolleys, clubhouse with club bar, lounge bar and restaurant, swimming pool, tennis and squash courts. Green fees around 75 euros. Click on the pictures on the left to visit their website. As with most golf clubs, it features a restaurant, bar, pro shop, buggies, tennis courts and pool. Situated between Moraira and Calpe is this 9 hole, par 60, 3,540 metre course set in a beautiful valley with surrounding views of the most prestigious properties in Moraira, the Penon de Ifach and the sparkling blue Mediterranean. The world famous designer Javier Arana created the Ifach club to be short and tricky with numerous obstacles. Many experienced golfers have remarked how deceptively difficult it really is, making it ideal for the holiday golfer who has little time but appreciates the challenge. There is a club bar with snacks , the Micheta restaurant, a large swimming pool and tennis courts.